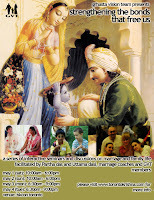 Marriage Counselling Seminars by Grhasta Vision Team ~ The Toronto Hare Krishna Temple! Marriage or Grhasta life is an important aspect of the Hare Krishna Community and in order to share the importance of married life and in particular, a Krishna Conscious married life, the Grhasta Vision Team was formed in 2003. This group of Hare Krishna counselors helps married couples and prospective couples cope with different aspects of marriage by means of interactive workshops and seminars. Partha das and Uttama dasi, two of the counselors from the Grihasta Vision Team will be here in Toronto conducting a series of workshops at ISKCON Toronto from Saturday, May 1st to Tuesday, May 4th. These seminars are open for all and will be held at ISKCON Toronto. In order to cover the costs for the seminar, there is a nominal charge for attending these seminars. For couples, it is $120 or $75 per person for all four days. If you chose to attend only a particular session, it is $20 per session. Prasadam (Vegetarian lunch or dinner) will be provided at the end of each seminar. To register for these seminars, please contact Praharna devi dasi. For further questions, please feel free to contact us! We look forward to seeing you at these seminars!